The holiday season is almost upon us, and so the biggest players in the tablet market finally have their latest flagships already available. The iPad Air, from Apple, and Microsoft's Surface 2 are some of the most interesting tablet flagships this holiday season. Considering how Windows RT and the original Surface have both failed to gain significant market share in the tablet market, it'll be interesting to see how the second generation Surface fares. Both tablets have very high-end specs, including high-resolution displays and very powerful processors, along with a high price tag. But which one is worth your money the most? Build and material quality is absolutely top-notch with these two tablets. The iPad Air has an aluminium unibody frame that's available in either "space" gray or silver. The Surface 2 is encased by silver-colored magnesium, or as Microsoft calls it, VaporMg. But what really sets the Surface 2 apart from all of its competitors is the built-in kickstand at the back, which this time around, stops at two different angles. It's also not very hard to notice that the iPad has some very thin bezels compared to the Surface 2, but that shouldn't really matter that much for most users, unless the looks of your tablet matter a lot to you. While in terms of materials the Surface 2 is on par with the iPad, and the kickstand is a very delightful feature, the Surface 2 falls behind severely in terms of dimensions and weight. It's actually not that thick, really. Measuring 8.9mm, it's on par with the ASUS Transformer Pad TF701T and the Lumia 2520, but it's still significantly thicker than the Samsung Galaxy Note 10.1 (2014 Edition) and the iPad Air. The weight is what really bothers me. At 676g, not only is the Surface 2 not significantly lighter than its predecessor, it's also the heaviest tablet we've seen this year. In fact, it's almost as heavy as the first-generation iPad, and is about 200g heavier than the iPad Air. The fact that the Surface 2 has a larger display than its competitors partially justifies the below average weight, and the larger area of the device also means that, due to the weight distribution, the Surface 2 might not feel as heavy as its weight suggests. We must, of course consider that the iPad Air and the Surface 2 have completely different purposes. While the iPad air is a device geared towards entertainment, the Surface 2 has productivity written all over it, considering that the official keyboard covers are an essential part of the Surface experience. There are three different keyboard covers available for the Surface 2, all of which attach to the magnetic connector on the tablet's bottom and double as a cover for the tablet's screen. There's the Touch Cover 2, which is 2.75mm thin and whose keyboard has capacitive buttons, not physical ones, and the keys are backlit. I'm not sure how Microsoft managed to put backlighting on such a thin keyboard, but it's very impressive. Then there's the Type Cover 2, which swaps the capacitive buttons for physical ones, thus providing a much better typing experience, but with the trade-off that the thickness increases to 5.4mm. Finally, there's the Power Cover, which is yet to be released, and is just like the Type Cover 2, but adds an integrated battery that extends the tablet's battery life, but it should be considerably thicker than the Type Cover 2. All of the covers provide an excellent typing experience and, together with the inclusion of Microsoft Office 2013 Home and Student, puts the Surface's productivity potential way ahead of the iPad Air. The Surface 2 and the iPad Air both feature excellent displays. With the iPad Air it's the usual 9.7" 2048 x 1536 "Retina" display, which is very crisp thanks to its 264ppi pixel density. The use of IPS technology attributes wide viewing angles to the display, and colors are both bright and accurate. The 4:3 aspect ratio of the iPad is great for browsing the web and reading e-books, but is known for causing letterboxing when viewing videos and movies. The Surface 2 has a much larger 10.6" display, but unlike its predecessor is suited with a good screen resolution. 1920 x 1080 pixels give the Surface 2 a pixel density of 208ppi, which is obviously less than the iPad Air's 264ppi. Both displays are very sharp, though, and the iPad Air's higher ppi is only significant enough to be slightly noticeable, and is likely to only make a difference when viewing very small text. The display also presents us with wide viewing angles and good color reproduction. The 16:9 aspect ratio of the Surface 2 is great for watching videos, but it does make use in portrait mode almost unbearable, because the screen is too long and too narrow, so keep in mind that you'll want to use the Surface 2 in landscape mode most of the time. In terms of sharpness and color reproduction, the two displays are quite close, even though the iPad Air is a tad sharper, but it all comes down to display size and aspect ratio. The Surface 2 displays might be a bit too large for you, and the choice in aspect ratio will depend on what you'll use your tablet for the most. These two tablets are powered by some of the best silicon available currently. With the Surface 2 it's an NVIDIA Tegra 4 processor, which consists of four Cortex-A15 CPU cores with a 1.7GHz clock speed plus a low-power shadow A15 core designed to help keep power consumption low. The Surface 2's high-resolution display is fitted with a large 72-core ULP GeForce GPU. 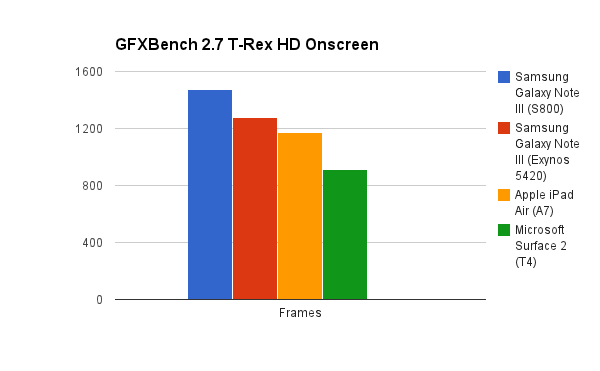 While the Tegra 4's GPU's benchmark scores are decent, the actual architecture the GPU is built on might disappoint you, especially considering it's an NVIDIA GPU. You get 72 discrete shader cores, which separate into 48 pixel shader units and 24 vertex shader units. This discrete pixel and vertex shader architecture was abandoned many years ago in favor of the more efficient unified shader architecture, which all current mobile and PC GPUs use, save for the Tegra 4. 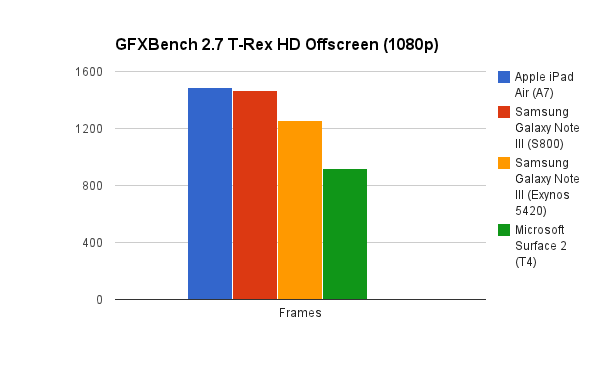 But as long as the benchmark scores are good enough, the older architecture won't really affect the user's experience. But, even though it's based on old architecture, the Tegra 4 has a very good GPU and yields some great gaming experience out of the small (but increasing) number of 3D intensive games on the Microsoft Store. Just know that the iPad Air will be a bit smoother most of the time. The iPad Air is powered by Apple's latest A7 processor. The A7's CPU consists of two Cyclone cores clocked at 1.4GHz. The Cyclone CPU is a custom ARM CPU designed by Apple, which is the first commercially available mobile CPU based on the ARMv8 64-bit architecture. While 64-bit's benefits lie mostly on larger RAM capacity, which isn't a concern for Apple devices, which are still on the 1 GB range, the architecture's larger memory registers does improve the overall efficiency of the CPU. Not only that, but the Cyclone core is just about the widest mobile CPU ever created, so we can expect to see single-threaded performance that's far ahead of any of its competitors, and is probably why Apple didn't need to go quad-core to keep its SoC offering competitive. The A7 is also fitted with a beefy PowerVR G6430 GPU, which, unlike the Tegra 4, is the pinnacle of contemporary mobile GPU architecture, with OpenGL ES 3.0 support and a unified shader architecture. So aside from the A7's higher benchmark scores compared to the Tegra 4, the A7 also has more potential for future-proofing. 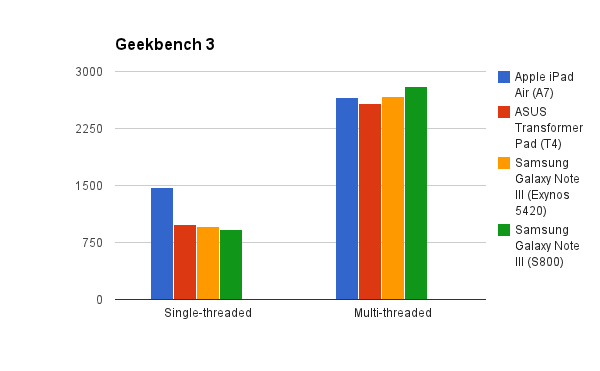 But since babbling about architectures probably doesn't matter to you, let's get to the benchmarks. First up is Geekbench 3, which measures CPU and memory speed. Note that since the Geekbench 3 app isn't available for Windows RT, I had to use the results from the closest match to the Surface 2 I could find running Android: The 1.9GHz Tegra 4-powered ASUS Transformer Pad. Since the clock speed here is 200MHz higher than on the Surface 2, keep in mind that the Surface 2's performance should be lower, however, since I'm comparing devices from completely different OSes, the difference between the Surface 2 and the Transformer Pad results I used here might account for more than just the 200MHz clock speed difference. 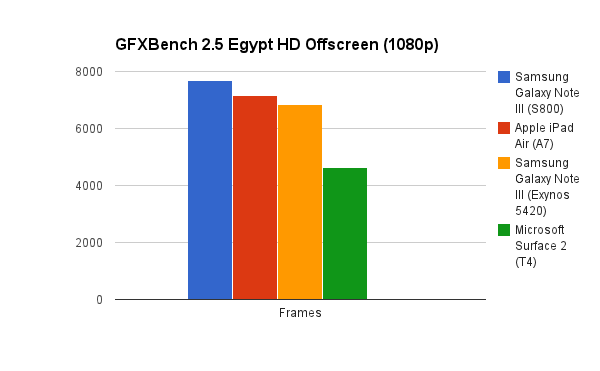 Don't expect a huge performance gap between the two Tegra 4 devices, though. This chart illustrates how the A7 has much better single-threaded performance compared to its rivals, and how that allows the SoC to offer competitive multi-threaded performance with half the core count of its competitors and a much lower clock speed. The A7 actually even beats the Transformer Pad (and probably beats the Surface 2 by a slightly larger margin) in multi-threaded performance, but not by much. It's a bit more complex than that though. It's still true that the Surface 2 has double the thread count compared to the A7, so it should be noted that, while having strong single-threaded performance is more important for overall performance, having more threads is better for things like multi-tasking, something that, coincidentally, is an important aspect of the Surface 2's productivity potential. Moving on to graphics tests, the Surface 2's results don't look so good. The Surface 2 is actually one of the slowest Tegra 4 implementations available, maybe because of the OS it runs on, or maybe because the graphics clock is reduced along with the CPU core. The iPad Air, along with Samsung and Qualcomm's latest offerings, trumps the Surface 2 in this test. In fact, the Surface 2's performance in this specific test is almost identical to the iPad 4. Moving on to the Onscreen T-Rex HD test, which is run on the devices' native resolutions, we see the iPad Air's higher pixel count holding it back, so that the 1080p Samsung Galaxy Note III outperforms it. Even though it has to power approximately 700 thousand more pixels than the Surface 2, the iPad Air still manages to beat it by a moderately large margin. The lighter Egypt HD test now causes the Surface 2 to fall way behind all of its competitors, while the iPad Air sits comfortably between the Snapdragon 800 and the Exynos 5420. 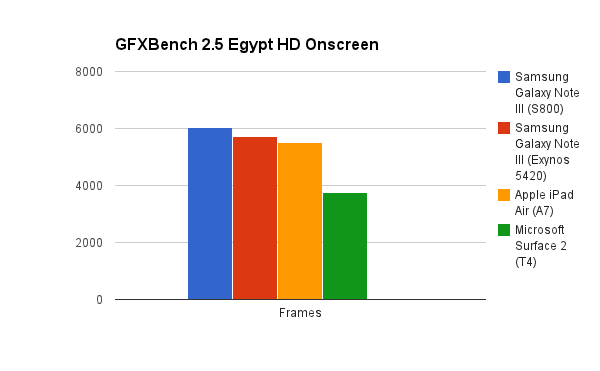 Finally, the Egypt HD test run on native resolution shows the iPad Air once again falling behind the Note IIIs slightly, but still far ahead of the Surface 2. Microsoft clearly doesn't care as much about gaming performance as Apple, otherwise they would've worked on optimizing the OS for its processor a bit better to at least yield benchmark scores that are close to other Tegra 4 implementations on Android. Then again, given that the Surface 2 is more of a working device than a playing device, I can understand why Microsoft wasn't too concerned about the GPU. It's a bit strange that the iPad Air is so much thinner and lighter than the Surface 2 and yet has a bigger battery. The latest iPad comes with a 32.4Wh battery, which is slightly larger than Surface 2's 31.5Wh battery. Both are very large batteries, and should keep these devices running for quite some time on a single charge. However, the iPad Air does have more pixels to power, which increases overall power consumption compared to the Surface 2. As for how much power the SoC draws, both tablets have processors built on 28nm circuitry. The A7 has less CPU cores to power versus the Tegra 4, but the T4's shadow A15 core saves it in that regard. When running intensive tasks, however, the Dual-core Cyclones are likely to draw less power than the Quad-core A15s. Anyways, both Microsoft and Apple claim the same 10 hour battery life. It's actually very easy to choose whether the Surface 2 or the iPad Air is better for you. If you want a tablet that offers the best productivity in the tablet market, pick the Surface 2. On the entertainment side Microsoft is making strides with Windows RT, as the 8.1 update improves the OS significantly and the Windows Store is improving on a daily basis, and with decent gaming performance and a bright, sharp display, the Surface 2 is not bad at all for entertainment, but the iPad Air is certainly better on this front. With almost unmatched gaming performance and one of the best displays in the mobile market, as well as what is just about the best app selection in existence, the iPad Air tackles your entertainment needs with near perfection. Of course, if you're fine with third-party bluetooth keyboards, the iPad Air, with its iWork app suite, also can also be used for productivity. While not as good as Microsoft's keyboard Covers, the third-party iPad keyboards are decent alternatives. There's also the pricing factor. The Surface 2 undercuts the iPad Air with a starting price of $449 for 32 GB of storage, compared to the iPad Air, which sells for $499 with 16 GB of storage (Note: Windows 8.1 RT takes quite a lot of space out of the Surface 2's 32 GB capacity, and with Office included you'll only have about 15/16 GB available). The pricing is still similar though, and it'll almost definitely come down to whether you want a device for work or for entertainment.